Sarah Brady, Ph.D. is the Interim Deputy Director of CCST. 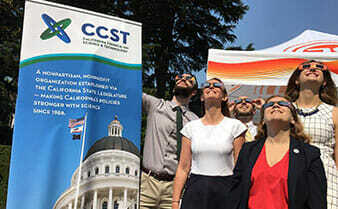 Previously she served as Director of Policy Engagement for CCST, where she managed large- scale commissioned projects requested by the Legislature and state agencies and led outreach efforts to connect CCST’s network of experts with state decision makers. Prior to joining CCST, Sarah served as Legislative Director in Assemblywoman Susan Bonilla’s office where she was hired after her placement as a CCST Science and Technology Policy Fellow in 2014. During her time with Assemblywoman Bonilla, Sarah initiated policy work to retain women in STEM careers by preventing pregnancy discrimination in graduate programs. As a result of legislation that she conceptualized and staffed through the process, the law now requires all California colleges to establish a family leave policy for their graduate students. Sarah also spearheaded legislation to increase the use of biomethane, reduce the cost of college textbooks, and improve access to computer science education. In addition, she conducted bill analysis and provided vote recommendations to Assemblywoman Bonilla on all bills related to utilities and commerce, energy, water, natural resources, and environmental toxicity. Sarah earned Bachelor’s degrees in Chemistry and French from North Central College and a Doctorate in Chemistry at the University of Oregon researching the degradation of plastics. She was also a GK-12 Fellow and an NSF-IGERT Fellow where she worked at the Hong Kong Baptist University. In her free time, Sarah likes to watch the Green Bay Packers, brew beer, camp, and is the Co-Chair for the CCST Science Fellows Alumni Group.